Share the post "9 Ways to Tame Hyperactivity and Impulsivity"
Hyperactivity and impulsivity are the hallmark symptoms of the hyperactive/impulsive type of ADHD. Children, teens and adults with hyperactivity move constantly and often have trouble sitting still. They may annoy their classmates, coworkers or their family with their fidgeting, constant motion and unconscious noises. They interrupt others, have trouble waiting for their turn and do things without thinking. This article discusses 9 non-medication techniques and strategies to calm down and reduce hyperactivity and impulsivity and to help gain some control over it. 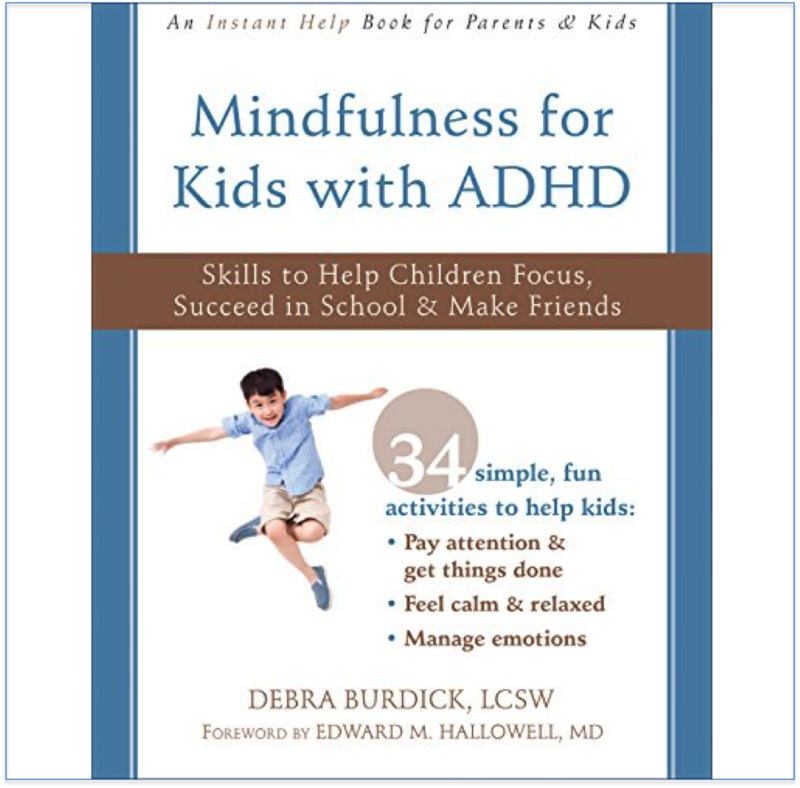 Effective options for reducing hyperactivity and impulsivity aim first to increase self-awareness and body awareness, then to practice self-control and physical calming. The nine options below are discussed more fully in my book ADHD: Non-medication Treatments and Skills for Children and Teens. 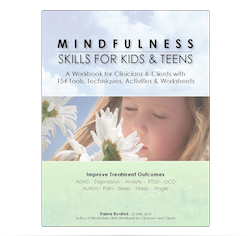 Although the book is specifically aimed at children and teens, these options apply to adults just as well. The specific chapters where you can find more information, worksheets, research and resources are noted below. Mindfulness Skills: Use these mindfulness skills to improve body awareness, self-regulation and calming. 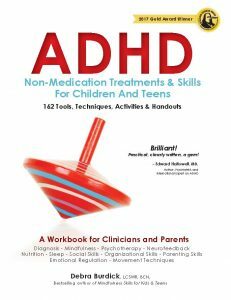 See Chapter 12 of ADHD: Non-medication Treatments and Skills for Children and Teens for more detail. Mindful Movement: Any simple movement can be combined with breathing in while moving in one direction and breathing out when moving back. An example is breathing in to the count of four while raising your arms above your head and breathing out to the count of eight while lowering your arms back to your side. Practicing movement while focusing on it in this way may gradually improve your ability to calm hyperactivity when you need to. Body Scan: A body scan is done by closing your eyes and focusing your attention on each part of your body one-by-one. Start by bringing your attention to your feet and noticing everything there is to notice about your feet. Then continue to slowly move your attention to your ankles, calves and shins, knees and on up until you have paid attention to each part of your body ending with your shoulders, neck and head. Balancing objects: Take something such as a coin or other small flat object and balance it on the back of your hand. See how long you can balance it before it falls off. Keep doing it until you teach yourself to sit totally still and keep the coin on your hand for a minute. Bring Your Attention To The Present Moment: A quick way to do this is to pay attention to everything you can see in front of you. Then methodically notice everything there is to notice about what is beside you, above you, below you. Tune in to the temperature, the smells and the sounds around you. Core Practice: Set aside a few minutes to sit quietly, clear your mind and focus on your breath. Every time you notice your mind has wandered, return your attention to your breath. Practice this for a few minutes at a time and increase the time until you can do it for 5 minutes. Neurofeedback: Neurofeedback is a form of biofeedback on brainwaves. It has been shown to be effective at decreasing hyperactivity and improving impulse control. 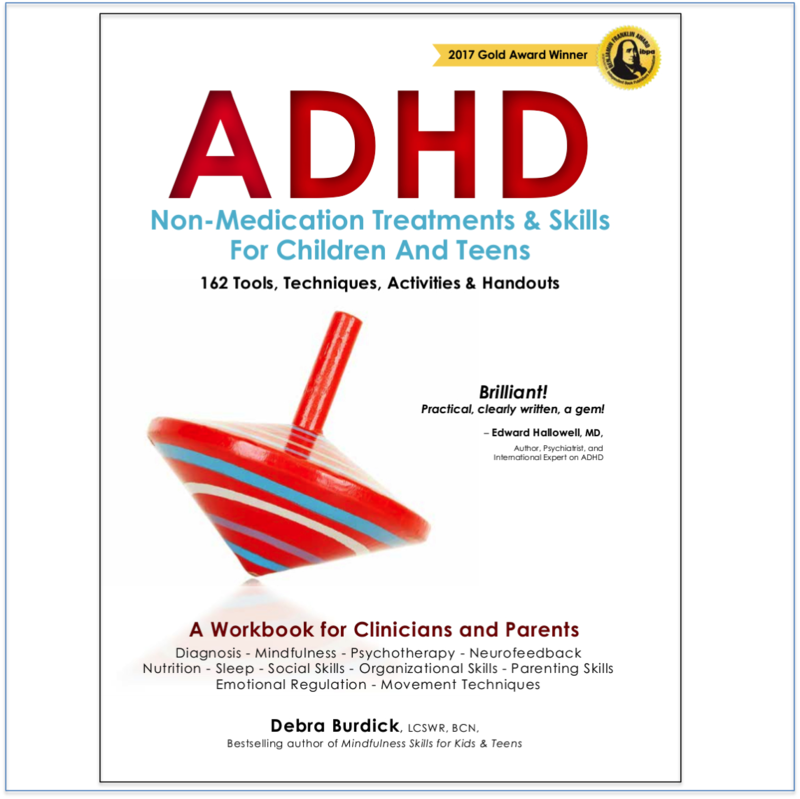 Learn more about using Neurofeedback for ADHD and where to find a practitioner in Chapter 11 of ADHD: Non-medication Treatments and Skills for Children and Teens. Sensory Integration: People with sensory processing issues often look like they have hyperactivity. Therefore it is important to make sure the impulsivity/hyperactivity is coming ADHD, not Sensory Integration issues. The treatments can be different. See Chapter 15 on Sensory Integration Therapy to explore this further. Food: Although the research on the effects of food on hyperactivity is not consistent, food sensitivities can be a significant contributor for some clients. When my own daughter was young she became out of control with hyperactivity when she had certain food dyes, sugar or milk. (I guess she didn’t read those studies.) Refer to Chapter 20 Common Food Sensitivities May Mimic or Increase ADHD Symptoms and use the Food/Symptom Diary on Handout 20-1-2 to help clients find out if food is a factor for them. Mineral Deficiency: Several studies have shown a reduction in hyperactivity and impulsivity with zinc supplementation. (Bilici et al., 2004). Others show a correlation between hyperactivity and magnesium deficiency. (Starobrat-Hermelin, 1997) See Chapter 21-1 Common Mineral and Fatty Acid Deficiencies for more information on this. Consider having your levels tested. Movement: Make sure you get lots of exercise and opportunities for movement. Movement has been shown to have a positive effect on the brain. (Hillman, 2014) and (Hoza, 2014) Make sure the teacher is not keeping the student in from recess to finish work. They will concentrate better if they get outside and play. Make sure you take movement breaks throughout the day at work. See Chapter 16 Movement to Optimize Brain Function. Impulse control: Those with ADHD often do things without thinking about the consequences. To gain more self-control and reduce impulsive behavior close your eyes and picture a traffic light with red, yellow and green lights. When you first think of doing something or saying something, stop long enough to picture the traffic light with the red light on. Then, while you cautiously consider the consequences of what you are about to say or do, picture the light turning yellow. Then when you make a good choice, you can turn the light green and go ahead and do or say it – or not—whichever was the better choice. This gives you time to stop, think and make a good choice. It only takes a few seconds. There is power in this process. Another option is to consider how you would feel if someone said or did to you what you are about to do or say to someone else. Imagining what others might feel helps you learn empathy. It will help you manage your impulse control and improve your social skills. 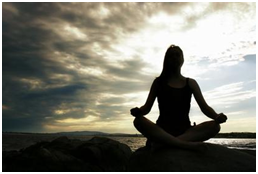 Body Work: Body work can help you relax and calm your body. Use massage, chiropractic, acupuncture for physical calming. See Chapter 17. Checklist: Print out the following checklist and try each option until you find those that work the best for you or your child. Debra – Your nine ways to tame hyperactivity and impulsivity are right on target! I particularly enjoyed learning two techniques that are new to me: (1) Mindfulness/Balancing Objects- Stopping to see how long you can balance a coin on your hand; and (2) Impulse Control/Traffic Light – Pausing to breathe and reflect (yellow light) before saying or doing things that might not go over so well. Thank you for sharing these techniques and for your wonderful book! I recommend it to all my ADHD coaching clients! It’s great to hear from you. Glad you found the techniques helpful. I am delighted that my book won the Benjamin Franklin GOLD award in Psychology. Thank you for spreading the word about the book.